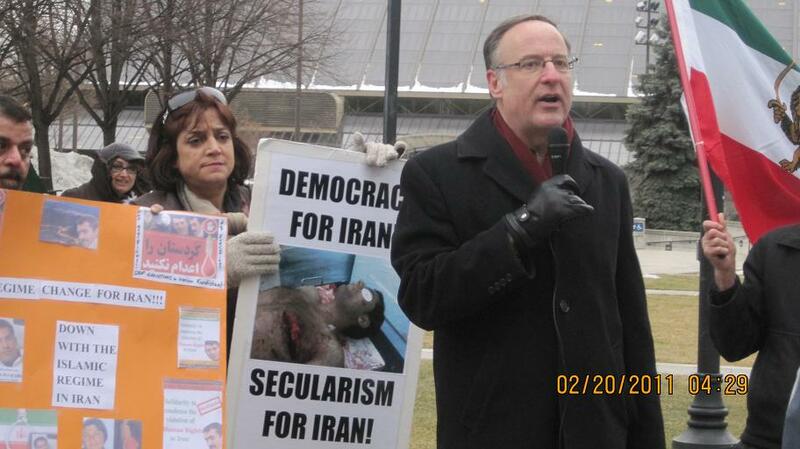 Today Robert Oliphant, Member of Parliament for Don Valley West attended a pro-democracy rally organized by Iranian activists in Toronto. The rally was organized in solidarity with the February 20th (1 Esfand) anti-government protests in Iran. Mr. Oliphant addressed the crowd briefly stating that it was not enough for seats to be shuffled (referring to Ahmadinejad and Mousavi) within the Islamic Regime and that he supported Iranian people’s demand for regime change in Iran. Iranian pro-democracy activists chanted slogans of “Regime Change for Iran and Down with the Islamic Regime in Iran” showing solidarity with the nationwide protests that shook Iran today, and sharing the demands of protestors in Iran for complete Regime change in Iran. Kurdistan and Kurd News: There was a general strike in most areas of the Kurdistan in Iran today. In the city of Saqez about 70% of all stores and Bazar was closed as the city joined the general strike in a protest against the Islamic Regime. There were major protests in the city of Mahabad with young protestors coming together at the Esteghlal square and chanting anti-Regime slogans. While the security forces were present and attacking the protestors, the protestors were not backing down and were busy defending themselves using rocks and sticks and were not backing down. The protestors were able to force the security forces to back down in Esteghlal Square. In an attempt to win back control the security forces fired at the protestors killing and injuring at least 4 people. The city of Bukan also joined the general strike and about 90% of all stores and Bazaar was closed today, even though the presence of security forces was significant and they were trying hard to prevent people from joining the general strike. In the city of Sanandaj protests took place in various parts of the city, 100’s of security forces were present throughout the city trying to prevent people from closing shop and joining the general strike, however the security forces were not successful and many store owners joined the general strike in Kurdistan by closing shop. In the city of Marivan as well. Two security forces had been killed by armed opposition groups last night. There were protests in the city with protestors chanting anti-regime slogans. Number of protestors have been arrested by security forces. In the city of Kermanshah as well protestors gathered in the main square of the city. In the city of Kamyaran there was a heavy presence of security forces who would not allow for more than a few people to gather at the same time. Also the home of Farzad Kamangar’s father who was executed last May be the Islamic Regime has been surrounded by security forces. Mahabad: Large number of protestors have gathered in and around Esteghlal Square and essentially have taken control of this area. Protestors are chanting slogans, throwing rocks at security forces and are attacking them. Sanandaj: The city Sanandaj is under general strike, all stores and business areas are closed. Very large number of protestors have gathered from Enghelab to Azadi square to Felestin square to Vali Asr square to Hafte Tir Square, Imam Hossein Square and Arya Shahr. Protestors are chanting death to Khamenei and their numbers are increasing by the minute. • Protestors have completely taken over Vali-asr Square and parts of Azadi street. While the Basij and other security forces are attacking the protestors, protestors are not taking this lying down and are fighting back! Tens of protestors gathered on this street were chanting death to dictator around 3pm Tehran time. • Clashes in Amir Abad between protestors and security forces, while the security forces are trying to create an atmosphere of fear and terror, protestors are fighting back and are not backing down. Strong presence of security forces in Ahmad Abad Street and Rahnamayi street in the city of Mashad. Security forces are preventing people from stopping in any one area and are pushing them to move forward. According to Daneshjoo News: At least one protestor has been killed by security forces during the protests in Tehran. 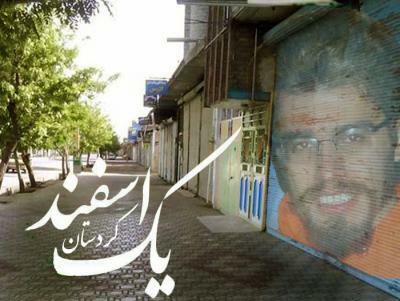 Following the February 14th pro-democracy protests in Iran, where at least two protestors Mohammad Mokhtari and Saneh Jale were shot and murdered by the Islamic Regime, Iranians have called a nationwide pro-democracy protests on Sunday February 20th 2011. Along with the nationwide protests a general strike has been declared in the Kurdistan of Iran on the same day. The strike is in solidarity with the nationwide pro-democracy protests and a sign of protest against the murder of the Kurdish student Saneh Jale by Regime agents. It should be noted that worldwide protests have been organized on February 20th to show solidarity with the nationwide protests and the general strike in Kurdistan. Activists in Toronto have organized a protest at the Mel-Lastman Square between 4-6pm in solidarity with the pro-democracy protests in Iran. I announce my solidarity with the nationwide protests in Iran and the general strike in the Iranian Kurdistan. February 11 marked the 32nd anniversary of the Islamic Republic of Iran. Due to the world’s focus on Egypt, the event went unnoticed by most, but it was not forgotten. Every February 11th sees anti-government demonstrations in Iran and worldwide, at which pro-democracy activists chant anti-government slogans against the entirety of the Islamic Regime, including not only the leadership, but the reformers. It’s not enough to reform the theocratic regime, say the protesters. It has to be torn down. 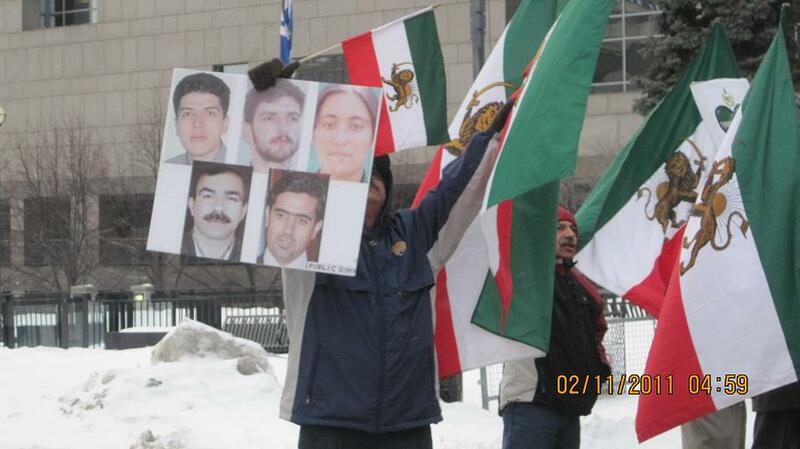 Tens of activists gathered in Mel-Lastman square today to protest against the Islamic Regime in Iran, which has been in power for 32 years. Today marked 32 years since the Islamic Regime’s highjack of the 1979 Revolution. Every year activists in Iran and abroad mark this day with anti-Regime protests. This year too Iranians in Toronto came together in freezing cold weather and chanted slogans such as “Regime Change for Iran, Democracy for Iran and Secularism for Iran”. James Bezan a Conservative Member of Parliament speaks out against the Islamic Regime, the recent atrocities and executions in Iran and the effectiveness of oil sanctions as a way for the international community to help the Iranian people bring down the Islamic Regime. I thank Mr. Bezan for his constant support of the pro-democracy movement in Iran, as well as his tireless efforts to bring awareness about the human rights situation in Iran.